Wälischmiller’s specialist engineers have designed a new remote handling vehicle, the V1000. 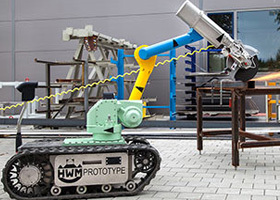 It is a fully remote-controlled handling vehicle designed to operate where safe human access is not possible, such as the Fukushima Nuclear Plant. The vehicle can operate inside buildings, outside in all weather conditions, and in water. It can climb stairs, open doors and drive over almost every possible ground condition, and with a robotic arm it can right itself should it ever be knocked over. It can be operated through a number of walls as well as at distances of 500 metres in line of sight. It has a carry load of 250kg and can pull weight in excess of two tonnes. The V1000 is unique with its highly flexible design and applicability, which enables it to be built to meet customers’ varying requirements. Not only is it variable in terms of scope and control, but it is modular in conception and can be equipped with anything to meet customer requirements. The V1000 is ideally placed to operate in radioactive environments and can be operated both wirelessly or with cables. It has been designed with ease of operation and maintenance in mind, with no licenses to operate required, and all electronics easily removable remotely. An on-board camera and global-positioning system will help the operator remotely control the vehicle, which in Fukushima will provide scientists and technicians their first sight into certain areas as they try to discover the extent of the clean-up required within the confines of the destroyed reactors.